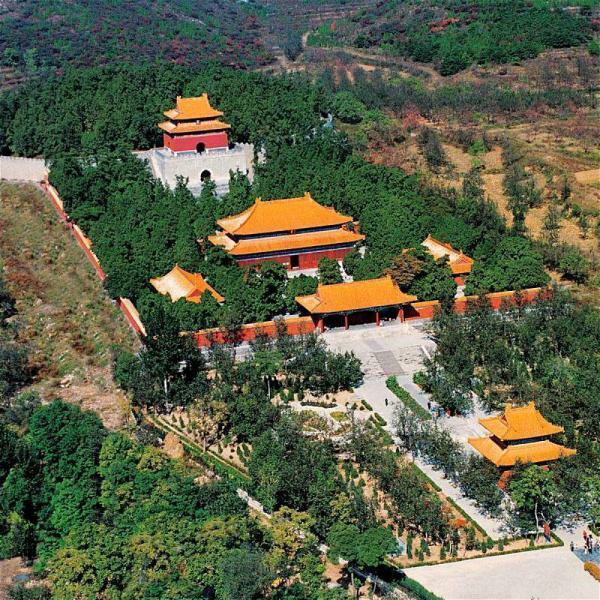 Of the 16 emperors who ruled China during the Ming Dynasty (1368-1644), 13 are buried in elaborate complexes in the valley of the Ming Tombs north of Beijing. 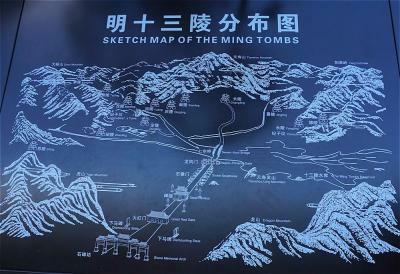 Tomb construction began here in 1409 and continued for 2 centuries. 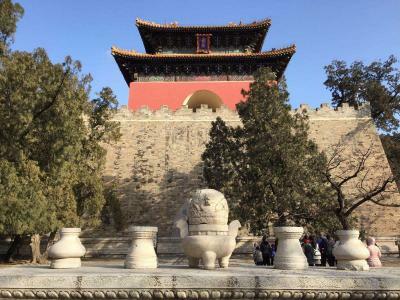 The valley was sealed off by a red gate at its only entrance, guards were posted to keep out the people, and no one, not even the emperor, could ride a horse on these grounds. 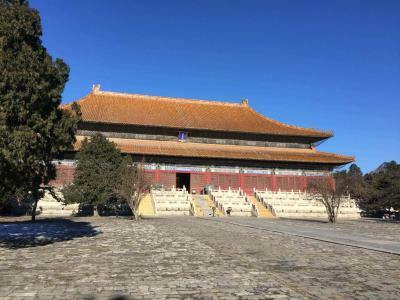 The site of this huge cemetery was chosen by the same Emperor Yongle (1360-1424, reigned in 1402-1424), who oversaw the construction of the Forbidden City. The site was selected with the greatest care, with geomancy taken into account. 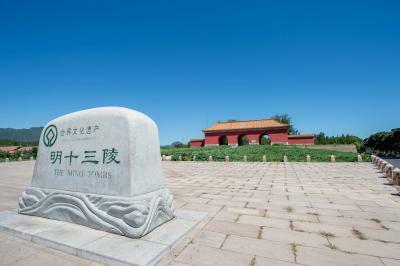 The tombs are located about 50 kilometers to the north of Beijing. 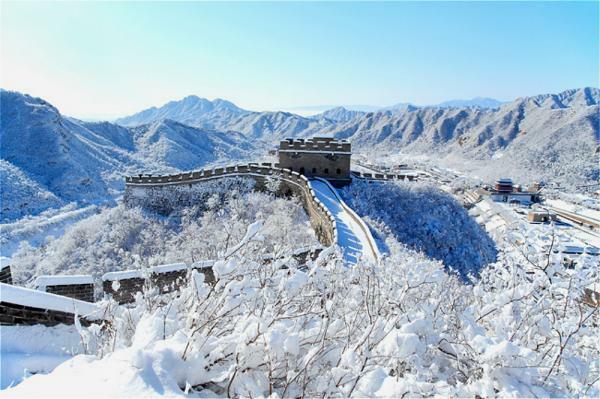 They are scattered over a basin approximately 40 square kilometers in area, screened by mountains on three sides and open to the Beijing Plain in the south. 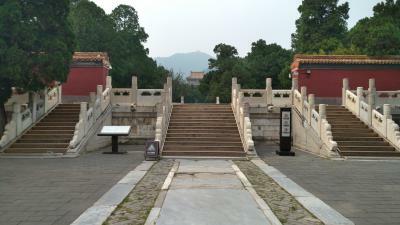 The road leading to the tombs is guarded by two hills, the Tiger Hill on the left and the Dragon Hill on the right. It was a forbidden ground except for those who were officially in charge of its upkeep. 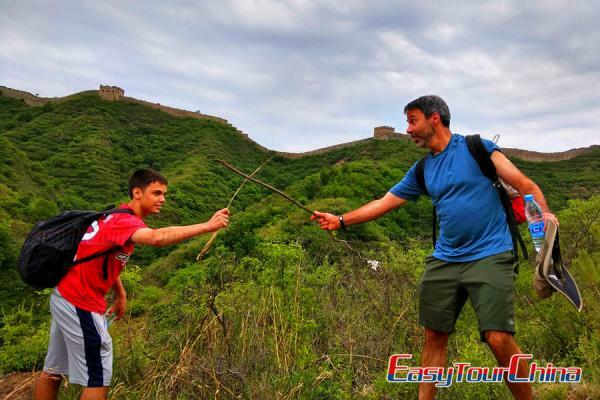 It was not allowed to cultivate land, cut wood or to take stones from here. 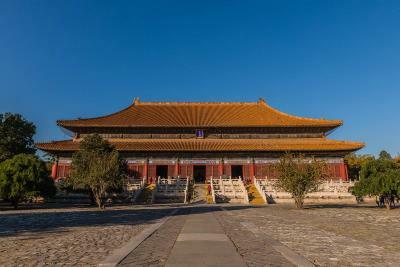 No one could enter it on horseback, even the emperor himself had to dismount at the gate. 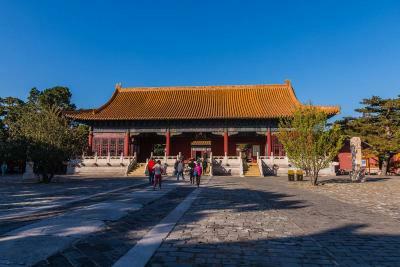 The tombs reflect a similar conception of Imperial architecture, consisting of walls, gates, courtyards, stairways, and elaborate pavilions with roofs of yellow tiles (yellow being the color of emperors). The actual burial chamber (a tumulus) is underground. 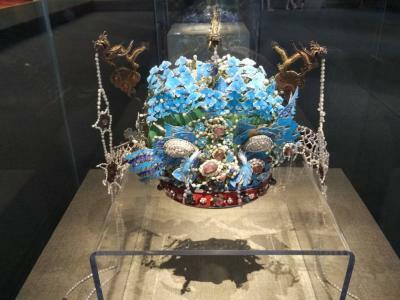 The emperor, his wife, and his favored concubines were the only people buried there, along with enough royal treasure to stuff a small museum. 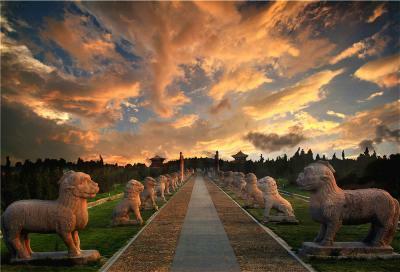 The 3 most frequently visited sections are Dingling Tomb (with underground Palace), and Changling Tomb and Sacred Way. 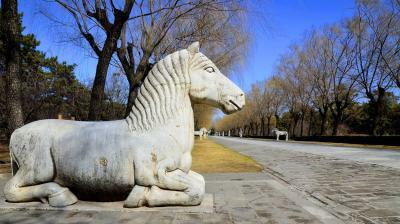 Dingling (royal security) is the tomb of Emperor Wanli, the 13th Ming Emperor. He was born in 1563, and was chosen and named crown prince when he was six years old. 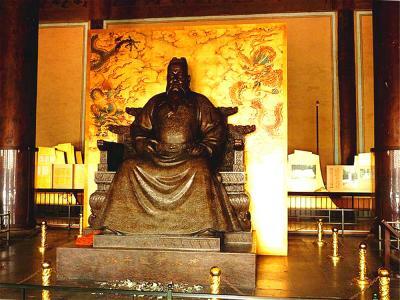 He ascended the throne at the age of 10 and ruled for 48 years until he died in 1620. Dingling is the only one of the Ming Tombs excavated so far. Excavation work took more than two years from 1956 to 1958. 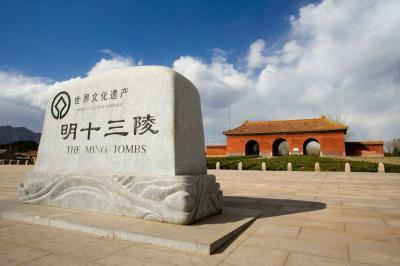 In 1956, a decision was made by the Chinese Government to open up the tomb. 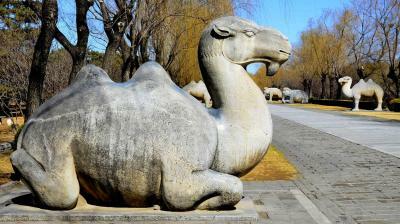 It was the first time that an imperial tomb was excavated in China in a scientific way. 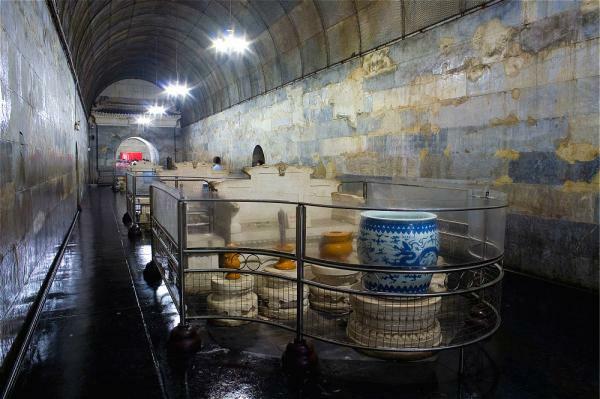 Dingling is now a museum made up of three sections: the Underground Palace and two exhibition rooms. 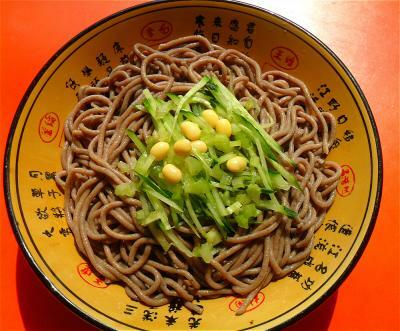 The objects on display are mostly original. 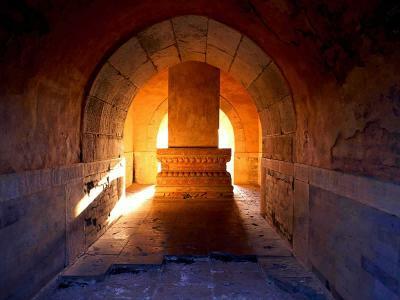 The Underground Palace was divided into 5 sections: Front, Middle, Rear, Left Annex, and Right Annex Chambers. 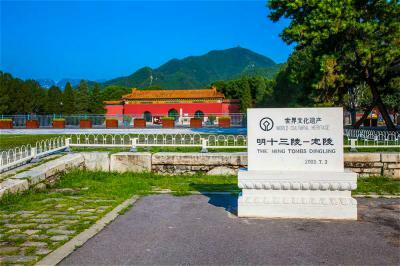 Changling is the tomb for Emperor Yongle, the third Ming emperor, and his wife Empress Xu. He ruled for 22 years and made some achievements in political, military, economic, cultural and diplomatic fields. Changling is located at the foot of Tianshou (Heaven and Longevity) Mountain and is the first and the largest of the Ming tombs. 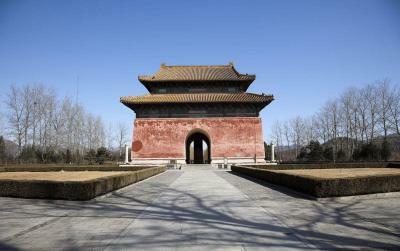 The tomb was constructed in 1409 and completed in 1427. It took almost 18 years. 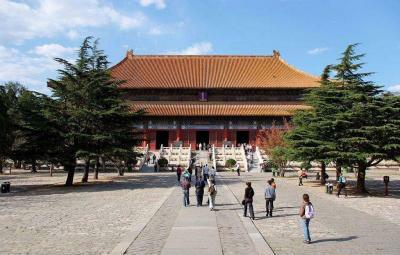 In architectural design, it is square in the front and round in the rear, and is divided into three courtyards. The main buildings on the central axis are still standing. Ling'en Hall, or the Hall of Eminent Favor, is grand and magnificent. It is 66.56 meters long from east to west and 29.12 meters wide from north to south. 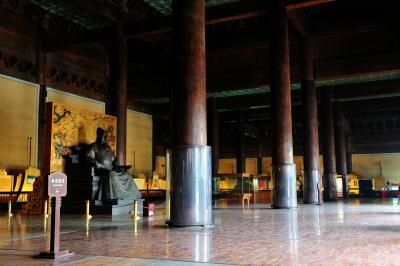 The 60 gigantic columns carved out of nanmu, a kind of cedar (this kind of nanmu can give off an unusual scent reputed to repel mosquitoes in summer), support the entire building. 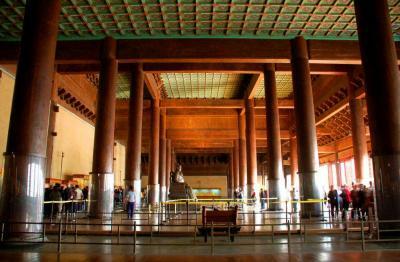 The four columns in the middle are the biggest, 1.17 meters in diameter and 23 meters in height. Each is made of a whole trunk. 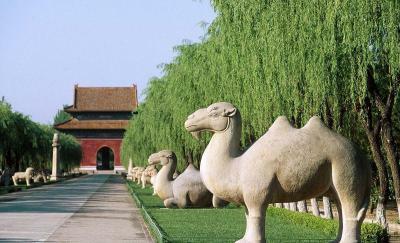 This kind of valuable timber came from Southwest China. 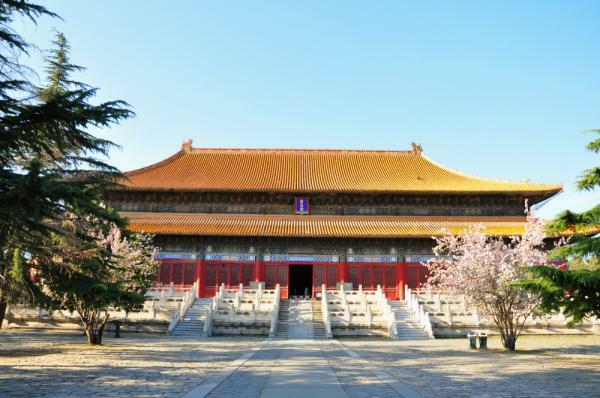 The succeeding emperors used the hall for offering sacrifices to their ancestors. 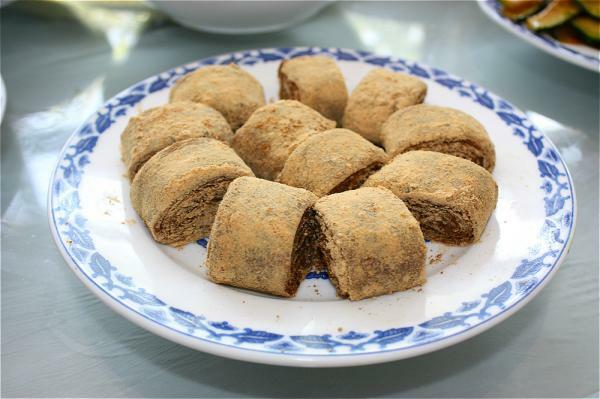 Known as “shen-dao” in Chinese, it means “the Way of the Spirit.” The body of the dead was carried over the route at funeral ceremony. 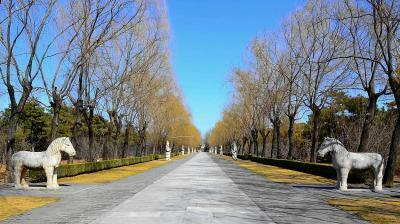 It is totally 7.3 kilometers long, from the Memorial Arch to the gate of the main tomb - Changling (the tomb of the third Ming emperor). 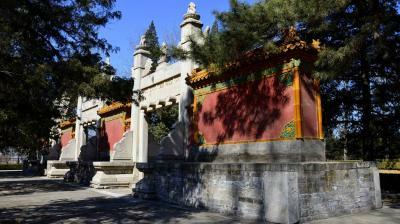 The highlighted part starts with a huge stone memorial archway, which is completely carved with Chinese white marble. 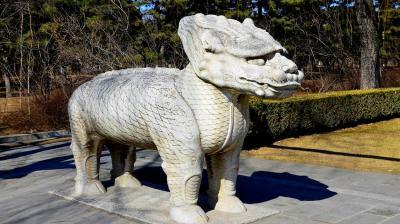 Then you will see the Shengong Shengde Stele Pavilion with a 50 tons tortoise carrying a 6.5 meters tall stone tablet inside. 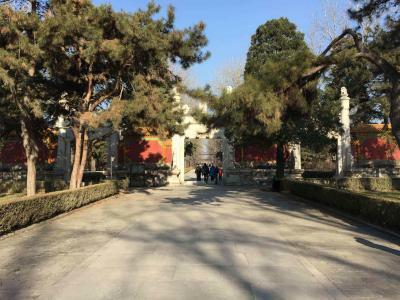 4 white marble columns, called “Huabiao” or “wangzhu” in Chinese, are positioned at each corner of the stele pavilion. On the top of each column seated a mythical beast. Then come 2 columns on each side of the road. 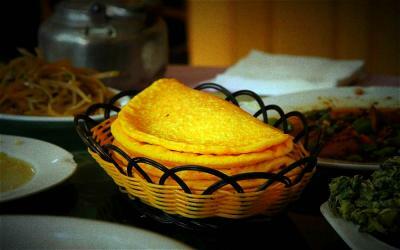 They are hexagonal, carved with a cloud design, and the top is shaped like a round cylinder. 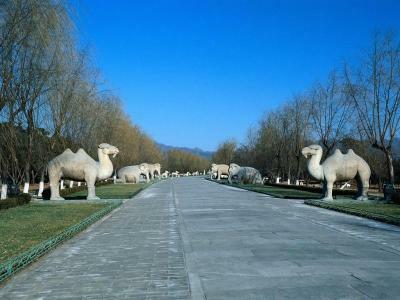 Along the road, 24 stone animals are arranged in a row. 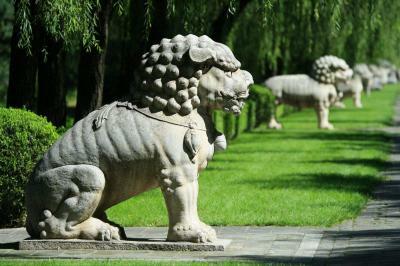 The animals are lion (symbol of power); xie-zhi (symbol of justice) was a mythical beast of the feline family, said to be able to distinguish right and wrong; camel (symbol of transportation); elephant (symbolizing auspices and peace); qi-lin (ky-lin, Chinese unicorn) was a sort of imaginary animal with a scaly body, a cow's tail, deer's hooves and only one horn on its head, (qi-lin presenting auspices, and exorcizing evil spirits); and horse (standing for expedition). These pairs of the animals are alternately standing and sitting. After them in a row, stand 12 human figures, i.e. 2 generals wearing sabers (representing imperial body guard generals), 2 civil officials (standing for emperor's close ministers), and 2 meritorious officials (symbolizing meritorious civil and military officials). 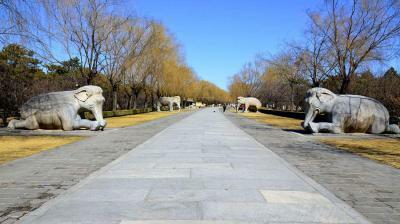 There are six statues on each side and twelve in all. 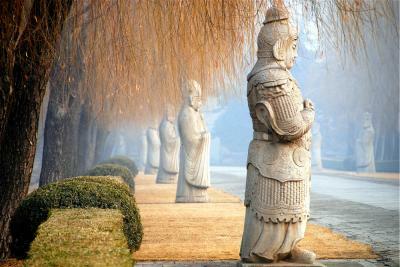 The bold and simple style of carving is typical of the Ming period (1368-1644). 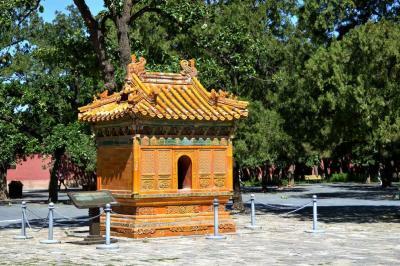 They do give people a sense of solemnity on the way leading to the Tombs. 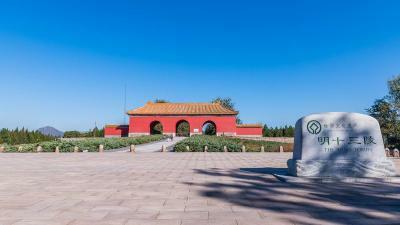 And the last one you will see is the Dragon and Phoenix Gate. 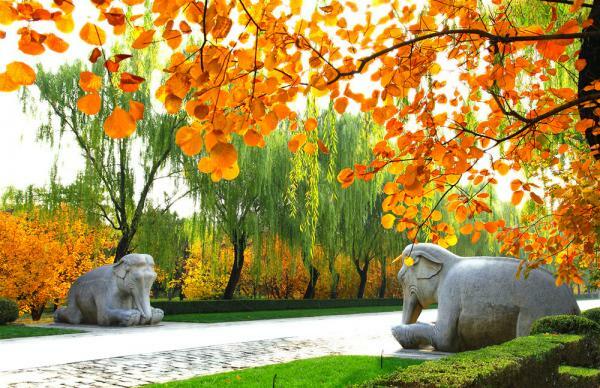 Location: Chan Ping County, 50 km (31 miles) northwest of Beijing. 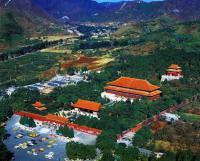 Bus 872 is running between Deshengmen and Ming Tombs every day. Bus 314 is running among Dingling Tomb, Changling Tomb and Sacred Way. Free for children under 6 years old (6 years old included) and under 1.2 meters (3.9 feet) tall. 2. 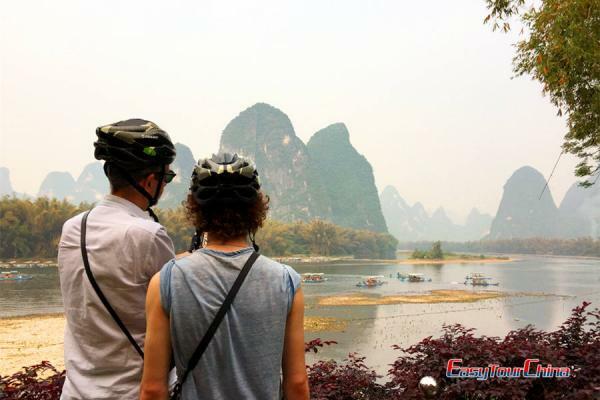 Try to avoid Chinese public holidays and weekends while planning your Beijing trip.